ArchitectUI is a clean, sleek dashboard UI theme/template and it’s built for modern applications that are powered by ReactJS. It includes lots of components, elements and widgets so that developers don’t waste time with the visual/design part. They just put some components together and voila, the app looks like it was built by a professional designer. ArchitectUI also comes in a HTML/jQuery version that has NPM dependencies managed through Webpack. All styles are compiled from SCSS stylesheet files. ArchitectUI will make your app look like it was designed by a pro designer. We’ve worked a lot in the past couple of months on this template to add as many features as needed and we’re sure that it’ll be a real help for anyone who’ll use it. Each of our themes come bundled with at least 3 different layouts arrangements. For example, ArchitectUI Dashboard React PRO includes a sample Mailbox, FAQ Page and Chat dummy applications. 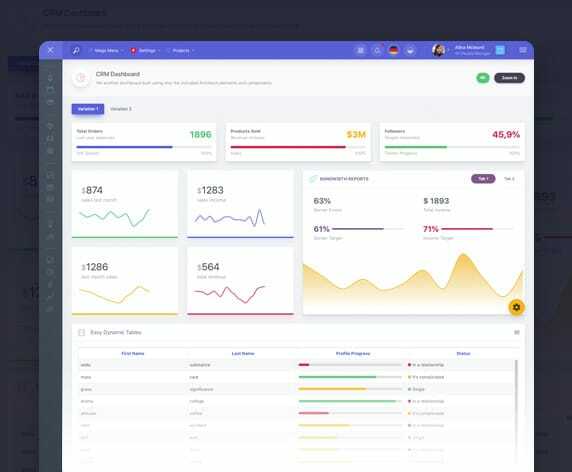 ArchitectUI Dashboard React PRO has 9 different dashboard designs included and fully coded that were built using only the included components and elements. You could easily merge together parts from existing dashboards to create brand new unique ones. ArchitectUI Dashboard React PRO works great on any screen size. From low-end mobile phones to Retina displays, it loads and acts perfectly. ArchitectUI Dashboard React PRO has it's own documentation files accessible either on DashboardPack.com or locally in the downloaded theme .zip archive. ArchitectUI Dashboard React PRO comes with it's own individual documentation files available both online and offline in the .zip archive. ArchitectUI Dashboard React PRO is available on a private Github repository for all buyers. If you have a quick question, you can join the ArchitectUI Dashboard React PRO Slack dedicated channel. Submit issues, questions or support requests in our ArchitectUI Dashboard React PRO dedicated support forum.